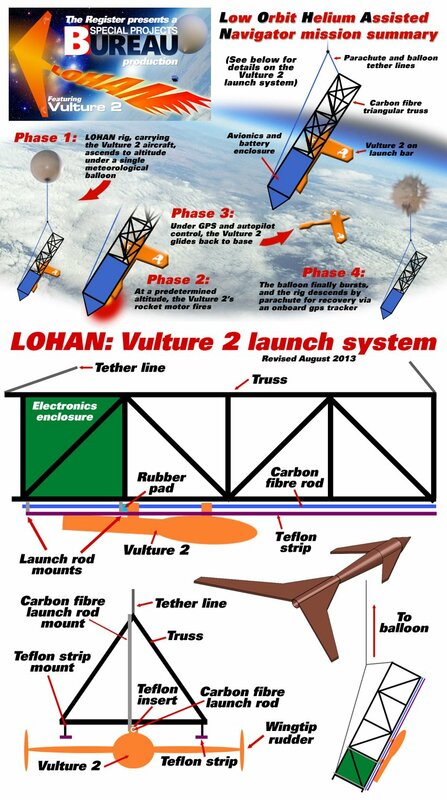 It's with more than a degree of staring at the heavens in exasperation that we confirm what those of you watching the live coverage of yesterday's Punch and Judy test flights had already deduced - that the Low Orbit Helium Assisted Navigator (LOHAN) team failed to make fire in the sky. 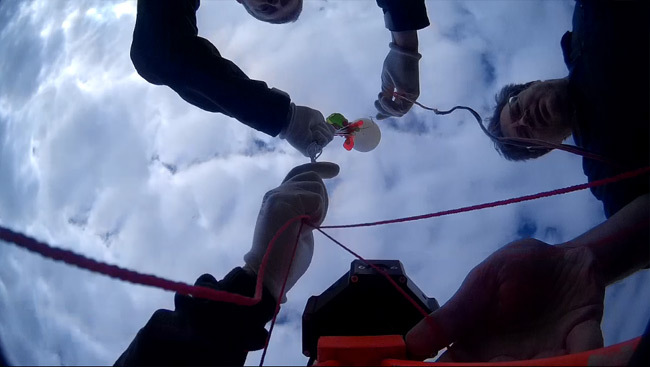 A blown fuse in the Special Project Electronic Altitude Release System (SPEARS) board resulted in a completely non-spectacular climax to the Punch mission, designed to see if we can persuade a solid-propellant rocket motor fire at altitude. The offending fuse is to prevent a nasty premature ignition event, should there be a firing circuitry fault. 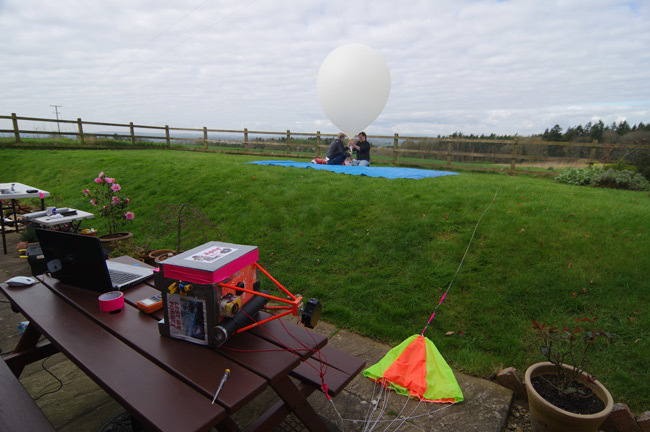 We're not sure what made it go pop, but it'd already blown by the time the Punch payload reached the programmed ignition altitude. Cue a certain amount of effing and blinding, although we're long enough in the tooth to know these kind of things come with the territory. Having done all the legwork in the Rocketry Experimental High Altitude Barosimulator (REHAB) chamber, we're pretty certain we have the ignition problem cracked, but obviously we need solid proof. Accordingly, the team will reassemble shortly for "Punch 2", and if that doesn't pan out, someone has a date with the wicker man as we attempt to appease the sky gods with a human sacrifice. In brighter news, the Judy flight showed that our Vulture 2 spaceplane rocket motor heater set-up works a treat. That's a very good thing indeed, because we know solid propellants really don't like the cold. So, we've got a couple more strings to our mighty imaging capability bow, which is a bonus. 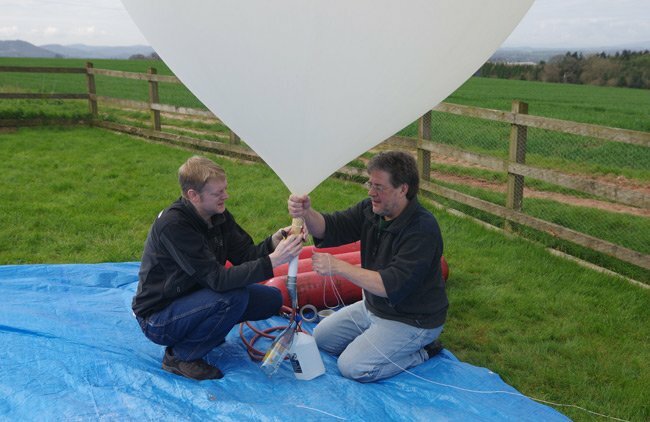 And if all that's not enough heartening tidings to sweeten the bitter taste of non-ignition, Dave and Anthony Stirk ran the first test of the dedicated new "Pi in the Sky" board, which sits on top of a Raspberry Pi and handles the chore of beaming live images to earth. That's working, and we'll shortly be installing one in the Vulture 2 as part of its Pitastic package. You'll excuse the brevity of this report, but I'm due down at Portsmouth this afternoon to lug the Vulture 2 spaceplane back to Spain. We'll bring full details, photos, post mortems, etc, from the Punch and Judy flights next week, after I get back to the SPB's mountaintop HQ. Please join us in offering a round of applause for team member Anthony Stirk (pictured at left, below, with Dave Akerman), who rose at the crack of dawn yesterday to drive down from Yorkshire for the launches. He originally wasn't going to come, due to work commitments, but the siren call of balloon tomfoolery proved too strong.